Since Goldingay does not believe that the Scriptures are monolithic in all that they claim or purport, imposing any sort of his own framework over the text would do damage to the voice of the Scriptures. Because of this, he actively tries to avoid asking his own questions of the text to form a framework; he would rather point out how all of the theologies of the Bible come together as more of a wider narrative than identify any core, which would probably reflect his own, rather than the Bible’s interests (p.16). He admits that, being a man located in a certain contextual location, his reading of the Scriptures will unavoidably be biased. I was glad that he acknowledged this reality early on: this book, if you’re familiar with Goldingay’s previous works, reads quite like what he has written before, but a lot of his thoughts are logically extended to their conclusions. This is quite unlike something you would read from, say, Thomas Schreiner, who would likely be more reticent to admit his own biases, laying his framework on the Scriptures with no self-referential acknowledgement. Though I generally think that the Scriptures are coherent, having been inspired by a single author, I find Goldingay’s approach very helpful. People with theology similar to mine can get caught in the trapping of finding a core theology, if one exists, to the detriment of other theologies of the Scriptures. For example, one of my professors at Northern Seminary finds the theme of covenant as central to the Old Testament. His problem, then, comes in explaining why the concept is nowhere to be found in the Wisdom books. Goldingay avoids this problem by letting every doctrine he finds speak for itself. Nothing seems sidelined here in order to prove his points, nor is anything missed. But, I do find it refreshing that he does maintain a sort of cohesion between each document, at least attempting to show why some divergent theologies are retained in the Bible. His discussion of the Wisdom literature, and its varying views of human development of thought, is one of the most helpful I’ve read on holding them all in tension within the same can (in this particular case, I also think of Peter Enns especially). 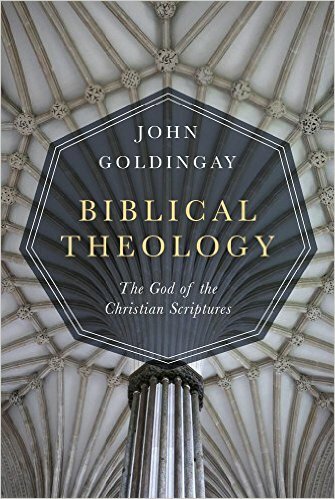 As a fan of biblical theology, I was thrilled when I learned that John Goldingay had published a book about biblical theology. Since my primary interests lie in the Old Testament, I eagerly devoured his work on Old Testament Theology – all three volumes. His book on the theology of the entire Bible, while less focused than his OT Theology, proved to be just as satisfying. I was worried, as I have felt with theologians before, that this would not focus nearly as much on the text as his earlier Old Testament (or First Testament, in his vernacular) theologies did. I was pleasantly surprised, and delighted, to see how Goldingay used the Scriptures. Those familiar with his work know the breadth of his knowledge of the text, but I don’t remember ever seeing the Scriptures woven together so precisely, and eloquently, as he has here. Texts are cited and used voluminously, but are never forced, nor do they feel as if they function as mere proof-texts. Rather, it feels as if Goldingay breathes the Scriptures, and, in many cases, it feels like the Scriptures are now a natural part in his language. Goldingay initially turns to the person and characteristics of God. While most seeking a Biblical theology have come to expect this, Goldingay offers his own distinctive approaches and viewpoints. Rather than starting with a formulation of the Trinity, he starts with the character of God, cleverly pointing out that if the fruits of the Spirit characterize the Spirit-led person, they must also be the characteristics of the Spirit himself. He then talks about the unified God, the Spirit, and the Son. This chapter is followed by a chapter on different modes and aspects of revelation. After a discussion of God, revelation, and his creation, Goldingay moves to a discussion of the Son and his work as a link to humanity, our condition, and our response and relationship to God. Even though he seeks to avoid artificial frameworks, I found it to be an added benefit that he sought to stay within familiar structures for a biblical theology, retaining some common themes and orders found within other works. This makes it familiar enough that we don’t get lost, but it retains enough individuality that this volume still seems fresh and necessary. While the book does focus on broader themes, like God, revelation, humanity, and ethics, Goldingay helpfully threads in and gives extra time to some minor, but important, topics. For instance, he includes a two-page long discussion on the ethics of the Canaanite genocide. While it, at the core, sounds like a typical evangelical answer, “God gave them a fair warning, and hundreds of years to repent!”, he frames the question within his discussion of God’s control over creation at large. I find this to be incredibly beneficial: no theological question exists in a vacuum, and the conquest is definitely a tough question for both “liberal” and “conservative” theologians. By placing these questions within broader frameworks, we don’t risk losing the forest for the trees of smaller, less fundamental questions. One of my personal favorite parts was his section on the Scriptures. Though Goldingay does not want to directly ask questions of the Scriptures dealing with modern day problems, he discusses how they unavoidably do help with these issues. “The people of God are always tempted to look at the world in the same way as other people. It is a regular purpose of Scripture to get them to look at things another way” (p.83). He says that another function of the Scriptures is not to command worship, or to tell us why we should worship, but they function in such a way to tell us how God would like to be worshipped (pp.119-120). He shows how the Psalms inspire our worship, our lament, our arguments, our dissent, and any other form of outcry to or toward God our hearts might be desiring. In the end, Goldingay’s Biblical Theology: The God of the Christian Scriptures is a great read, well worth the price of entry. It’s well thought out, well argued, well supported, and more than helpful. Even in my first read through, I had noted six areas I wanted to revisit before I had reached page 250. I will find myself frequently citing and revisiting this book for a while, especially while I am in school. I can also see pastoral implications to his theology, and the ways in which he challenged me to rethink certain aspects of theology and certain aspects of the Scriptures themselves. This entry was posted in Book Reviews and tagged Biblical Hermeneutics, Biblical Theology, Book Reviews, John Goldingay, theology by joecrow91. Bookmark the permalink. Since Goldingay normally silences the voice of the New Testament or rather does not deal with the hermeneutical challenge the NT possess on the OT, I am interested to see what he does with it in BT. Secondly, it would be interesting the effect of his tendency not to believe everything the scriptures record as historically true.